March 4th, 2016 by Roy W. Spencer, Ph. D.
Now that John Christy and I have had a little more time to digest the new paper by Carl Mears and Frank Wentz (“Sensitivity of satellite derived tropospheric temperature trends to the diurnal cycle adjustment”, paywalled here), our conclusion has remained mostly the same as originally stated in Anthony Watts’ post. While the title of their article implies that their new diurnal drift adjustment to the satellite data has caused the large increase in the global warming trend, it is actually their inclusion of what the evidence will suggest is a spurious warming (calibration drift) in the NOAA-14 MSU instrument that leads to most (maybe 2/3) of the change. I will provide more details of why we believe that satellite is to blame, below. Also, we provide new radiosonde validation results, supporting the UAH v6 data over the new RSS v4 data. Here I have included their Fig. 7 as an inset to show that they know there is a substantial trend difference between the old NOAA-14 MSU and the newer NOAA-15 AMSU measurements. That trend difference amounts to +0.20 C/decade…a large discrepancy. Importantly, Mears and Wentz choose to leave this calibration drift in without adjustment for it. In effect they are saying, ‘we don’t know which of the two satellites is at fault, so we will leave both satellites in without adjustment’. the NOAA-14 satellite orbit was drifting far beyond any of the other dozen satellites in the record, leading to warming of the instrument itself (which is why we cut the record short after 6 yrs, RSS uses all 10 years), while the NOAA-15 satellite had very little orbital drift during its overlap with NOAA-14. We find it curious (to say the least) that RSS would treat these two satellites as equally accurate. About a third of the trend difference appears to be due to a change in the RSS method for diurnal drift adjustment, as indicated by the dashed ovals in the second plot, above. (Diurnal drift is the result of the satellite overpass time changing over the years, so that measurements are made at a different times of day; over land in particular this causes a drift in measured temperature due to the day-night cycle, not climate). Their new adjustment appears to provide a stronger correction for the diurnal cooling of the NOAA-11 satellite (first oval) and the NOAA-18 satellite (second oval). RSS uses the diurnal cycle from a climate model (CCM3), with empirical adjustments. We (UAH) use a pure empirical adjustment based of the the observed drift between NOAA-18 and NOAA-19 (for the “1:30” satellites) and NOAA-15 and Aqua (for the “7:30” satellites). The evidence suggests that the new RSS v4 MT dataset has spurious warming due to a lack of correction for calibration drift in the NOAA-14 MSU instrument. Somewhat smaller increases in their warming trend are due to their use of a climate model for diurnal drift adjustment, compared to our use of an empirical approach that relies upon observed diurnal drift from the satellite data themselves. While the difference in diurnal drift correction methodolgy is a more legitimate point of contention, in the final analysis independent validation with radiosonde data and most reanalysis datasets suggest better agreement with the UAH product than the RSS product. Chip Knappenberger has pointed out that, while the warming in RSS v4 versus UAH v6 might be as described above, when RSS v4 is compared to RSS v3.3, the increase in warming might be mostly due to their new diurnal cycle adjustment. In other words, the NOAA-14 calibration issue was also in their v3.3, but maybe it was obscured more by diurnal drift adjustment issues. I think I have now solved the problem with some of the images not appearing/being available. The problem will continue to exist for older posts. I see the UAH 5.6 numbers got posted today. So, we have 0.90C versus the old record in that data set of 0.66C. So they are modeling the adjustments now too? Talk about anthropogenic influences. Pretty soon we will have Sim-scientists and Sim-radiosondes. they were using a climate model before for the diurnal drift adjustments, too. It is a reasonable technique to try…although even Trenberth has published work on how bad the diurnal cycles are in climate models. Models tend to do convective adjustment over land too rapidly, while in the real atmosphere it takes more time for convection to form and develop. This distorts the timing of temperature changes. Understood, but one would reasonably expect information of this magnitude to utilize every available, and relevant, data point as part of an overall vetting process prior to distribution. Let alone the unfit data included in this case. The pattern we continue to see in most climate science reporting is very clear at this point. Policy accommodation, not sound science, is in the drivers seat. Thanks for this post, Dr. Roy, very timely. Thanks for your untiring work on the MSU project, the world is richer for your contributions. Out of curiosity, I wrote a Java program to read the 5.6 and 6.0beta off the URLs and print differences by year, rounding to the nearest .1C. Basically, 6 beta makes the 90’s warming and the 2000s cooler relative to 5.6. Why would that be? So finaly, we can conclude, that UAH 6.0 TMT works much better with the RATPAC (B) which since 1997 had inhomogeneities. So in my opinion, RSS is true or can you explain why a Dataset with inhomogeneities shoud be better then one without. there are over 800 radiosonde stations worldwide making simultaneous measurements daily. Ratpac is not the final word in radiosonde data. Indeed, considering the source (NOAA), I need convincing demonstration that ratpac is to be relied upon in preference to the other 700+ radiosondes. That demonstration has not been forthcoming. There has been some mumbling about “inhomogeneities”, without any explication. y, i know, but this doesent explain, why Spencer using this as argument against RSS by using RATPAC (B), so this way we can make the same and say its more likley that UAH is wrong based on this. Yes, there are 700+ raob stations, but not reliable distributed data from all 700. RATPAC tries to acheive uniform distribution with the best of the best stations. Even then, the tropics have very poor sampling – less than 60% of total possible months. RAOB stations are mostly over land and strongly skewed toward wealth nations that can afford lots of sites and to have the most reliable instrumentation ( and personnel ). There’s also a TIME of observation problem. Upper air doesn’t modify as quickly with sunshine as the surface, but RAOBs are 00Z and 12Z ( some stations have one, the other and a few both times ) but local day and night are not distinguished. Really, global 0Z,6Z,12Z, and 18Z would allow for nighttime only RAOBs. Having a Global RAOB network with 6 hourly obs, a consistent instrumentation and a dedication to 100% sampling would help. The bar chart in the post used RATPAC-B, which is what one of the RATPAC authors recommended to John Christy. John also re-ran the results with RATPAC-A, and UAH still scores better than RSS, but the difference isn’t as striking. The RAOBavg results then have almost no change, since it is an average of 4 raob datasets. More significant than the global trends is the absence of the Hot Spot, which is what Spencer and Christy have been writing about since the early 90s. The missing HotSpot doesn’t mean CO2 isn’t having an effect, but the HotSpot is the largest negative feedback according to the GCMs ( lapse rate feedback ). Since that is not occurring, it means the warming we do have at the surface is larger than it would be if the Hot Spot were occurring. Things are dynamic, the Hot Spot could of course occur in the future, but it represents a significant failing of the models. And it hasn’t appeared even in smaller periods since the RAOB era even though it is a prevalent feature for such periods in the models. I don’t think it’s that simple…negative lapse rate feedback tends to be about half the size of positive water vapor feedback. So, it might be that the lack of a hotspot is indirect evidence that water vapor feedback isn’t as stong, which would reduce warming both at the surface and aloft. It increases with increase of greenhouse gases. As an increase of greenhouse gases cools (and only slightly raises the altitude of) the tropopause while warming the surface and lower troposphere, the troposphere gets increasingly convective. Not cloudier with warming since clouds get more efficient at transporting heat – but global temperature seems more stable at warmer interglacial times (and temperature levels) than during glacial times of the current ice age period times. During glacial periods, the temperature-varying lapse rate feedback was smaller (less negative) when the world was colder. When ice/snow coverage was greater (with greater variability in millions of km^2) but short of “snowball earth”, and the greater variability was where there was a lot of sunlight, along with less of the lapse rate negative feedback, Earth’s climate was less stable. I think that the lack/shortfall of the tropical upper troposphere hotspot is due to overall troposphere relative humidity decreasing as a result of warming and increase of greenhouse gases. Greenhouse gases cool the stratosphere and stratosphere-adjacent troposphere while they warm the surface. The tropical upper troposphere hotspot of warming appears to me as a model result where increased water vapor presence causes the lapse rate to decrease in the convection-prone tropics. However, I see such water vapor presence increase increasing the heat-transport efficiency of (cloudy) updrafts. I see this meaning that a warmer world has its cloudy updrafts covering a smaller percentage of a warmer world because they get more thermally effective, and a larger percentage of such a warmer world gets covered by largely-clear downdrafts. This would make the cloud albedo feedback a positive one, but the water vapor feedback becomes less positive than with constant relative humidity as the world warms. I think that the sum of the cloud albedo and water vapor feedbacks to global temperature change is close to what the water vapor feedback alone would be with constant relative humidity. Sometimes, I think this sum can sometimes/often get less than the constant_RH water feedback alone. The “Missing” hotspot is at first a matter of the tropics. The “new” TTT 4.0 has a slope of 0.19K/decade, the TTT 3.3 had a slope of 0.07. This means nothing else then an amplification with the factor 2.66. In relation to the slope of GISS tropics during 1979…2015 (0.11 K/ decade) this emerges the tropical hotspot in the troposphere very impressive (due to DD-correction)! Here is the comparison of modeled versus UAH (r6b5), RSS ( 3.3TLT, and 4.0TTT ), RATPAC, RATPAC excluding unreliables ( < 50% ). The Hot Spot does not appear. The TTT is not strictly comparable with the UAH-MT, and RSS hasn't released a version 4.0 or LT, so it's not a good match, but there it isn't. Ist clear, because RSS 4.0 in TMT is much better matching the Trend as UAH6.0 does. And here we have a graphical analysis of RSS vs RATPAC …..
On examination of the above we can clearly see that the sat record matched well with RATPAC data until the time of the MSU > AMSU change-over. Then the data drift apart. NOT a discontinuity but a drift. The data are getting worse. As RATPAC data are (from Christian’s link) …. 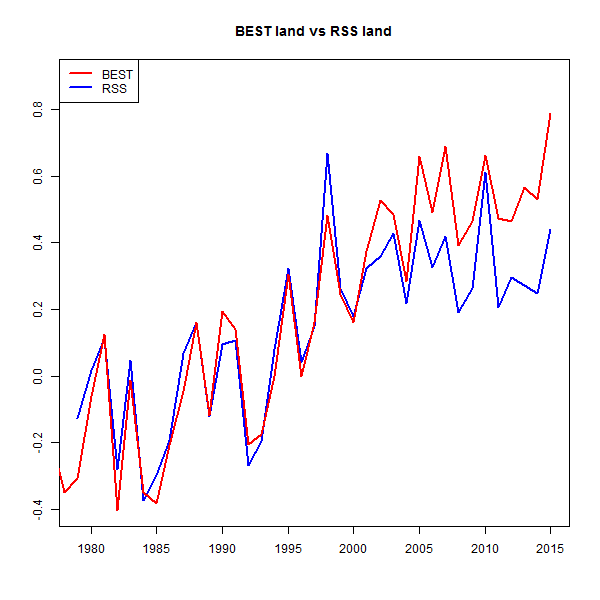 RSS is (was) also deviating from BEST land data…. Diurnal drift corrections have most effect over land. That land stations suddenly warmed relative to the Sat data since the time of the NOAA14 MSU > NOAA15 AMSU changeover is beyond incredible. So Sat data deviate from every other surface temp database at the same point. NOAA15 (drift) to my mind is indicted as the culprit. I am not sure where Roy has got his RATPAC data from and what levels he is correlating against. I have just looked at the RATPAC data at http://www1.ncdc.noaa.gov/pub/data/ratpac/ratpac-a/RATPAC-A-annual-levels.txt and http://www1.ncdc.noaa.gov/pub/data/ratpac/ratpac-b/RATPAC-B-annual-regions.txt . I get a similar result to Christian (i.e. 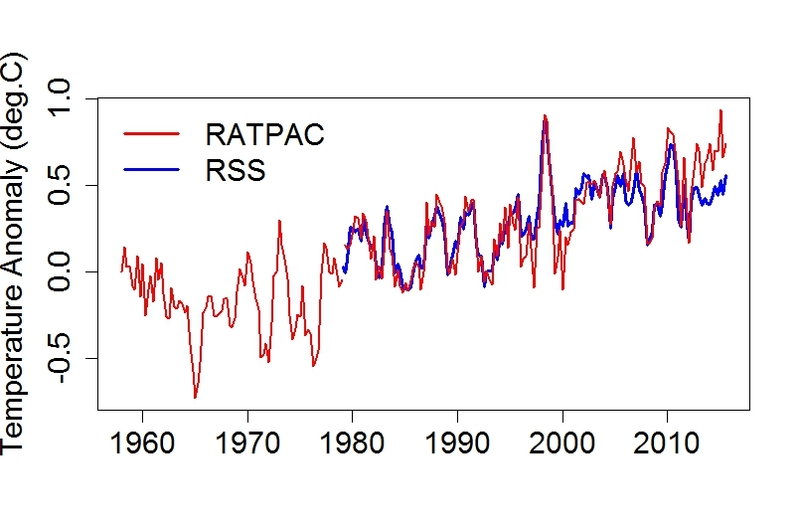 better correlations with RSS compared to UAH) for the annual RATPAC A data from 1979 to 2015, if we average 850-300 mbar temperatures. For RSS v4 the correlation with RATPAC A is R^2 = 0.91 while for UAH v6 beta 5, R^2=0.78 and NOAA Star TMT, R^2= 0.87. The NOAA Star TMT data is from http://tinyurl.com/z8fxhe5 . Needless to say the correlation between RSS v4 and NASA Star TMT is excellent at R^2= 0.98 while the correlation for UAH TMT and Star TMT R^2 = 0.92. For RATPAC B using the average for average for 850-300 mbar, I also find RSS v4 (R^2= 0.92) being superior to UAH (R^2= 0.87) and NASA Star TMT (R^2=0.90). It would be great if Roy could link to the data sets he used to avoid confusion. The difference between Ratpac A and B Global is that B is weighted by latitude only, whereas A is weighted by both latitude and longitude. Thus, in A the oceans get a more fair representation. A has a slightly higher trend than B during the alleged pause years, because the troposphere over oceans (maybe a little contraintuitive) has warmed faster than over land during this period..
I’ve asked John Christy about the discrepancy…he’s the one who did the raob comparisons. OK, according to John Christy, it’s because you are using the 850-300mb layer to estimate MT, which is a little apples and oranges. You need to do appropriate weighting of all pressure levels up into the lower stratosphere for MT. If you use only 850-300, you won’t sample the statospheric cooling that MT includes, the warming trend will increase, and so you will get better agreement with RSS because it has a warmer trend. So you are saying TMT is considerably influenced by stratospheric cooling? If this is true, why do you call it “mid-troposphere”? Moreover, since TLT is calculated using the TMT values, is it then also considerably influenced by stratospheric cooling? Sorry, I missed the posts above for March 4 where Roy states that they used RATPAC B. He also states that John Christy ran the results for RATPAC A and UAH was still better than RSS but by a smaller margin. This is in contrast to my results above which showed the inverse for RATPAC A. What concerns me is that using my rough and ready approach, I could get significantly higher values of R^2 for all data sets for RATPAC B than John Christy, despite him having presumably better access to the data. Something is seriously amiss here. By the way the weights I used are as follows Surface 0.48 (0.39), 850 mbar 0.61 (0.47), 700 mbar 1.04 (0.56), 500 mbar 1.175 (0.6), 400 mbar 0.983 (0.55) , 300 mbar 0.691 (0.42), 250 mbar 0.497 (0.35) , 200 mbar 0.447 (0.25), 150 mbar 0.388 (0.16), 100 mbar 0.194 (0.08), 70 mbar 0.109 (0.045) and 50 mbar 0.064 (0.02). The bracketed figures are my estimates from the MT profile, while the preceding values are the combined weights used to compensate for the unequal sampling of heights for the RATPAC data. This was done by multiplying the estimates by the average of the separation in kms above and below each pressure level. For the surface it was just the height above the surface of the 850 mbar level. I did a a rough calculation by eyeballing the MT (MSU/AMSUS) profile (http://www.drroyspencer.com/wp-content/uploads/MSU2-vs-LT23-vs-LT.gif) and obtaining the appporiate values for each pressure level (from the equivalent height). I used these, in combination with the layer thicknesses, to weight the values from the surface to 50 mbar which was then used generate a weighted average profile from 1979 to 2015. The correlation for this data for RATPAC A was R^2 = 0.86 for UAH 6 beta 5 , R^2 = 0.88 for RSS 4 TMT and R^2 = 0.84 for Star TMT. However for RATPAC B ,using the same weightings, the values were more in line with your data ie. for UAH R^2 =0.90 , For RSS R2^=0.82 and for Star R^2 = 0.80. Because it was just a rough calculation I am not that concerned about the magnitude of the correlation coefficients for either data set. What is of concern is the choice of RATPAC data set does change the picture somewhat. It appears (correct me if I am wrong) that RATPAC A is the preferred set of measurements for such comparisons. To further clarify, could you please provide the weights for each level that was applied to the RATPAC data and do you know whether RATPAC A or B was used by John Christy? Its also shown in the Paper of Maers & Wentz (2016), see figure 9, that RSS4.0 TMT is working well with STAR and UW. I think in this way, because RATPAC (A) is more warming then RATPAC (B), UAH will better match B and RSS A as you had shown. For that, i think its not that easy which Spencer here claimed, but on the other hand, i am not an expert on this field, so i prefer to say, its not clear which is the better Product in TMT, it is looking to that what its alway did, Sat-Products are very very uncertain. As I write this, it is close to noon, EST, March 4, 2016. What is Earth’s temperature right now? Of course, we don’t know. And, what was Earth’s temperature, this time and date, 100 years ago. Of course, we don’t know. BUT, we DO know the Earth has warmed 0.79837450178 degrees C in that time! Although comparison of RSS 4 with UAH 6 is useful, I think it would be even better to include the previous version of RSS (3.3) in the comparison. If RSS 3.3 resembles UAH 6 greatly more than RSS 4 does, then this adds support to a contention that something is wrong with RSS 4. On the other hand, RSS version 4 seems to remove the discrepancy between RSS and UAH. Maybe there is no need for a UAH 6.x beta anymore? 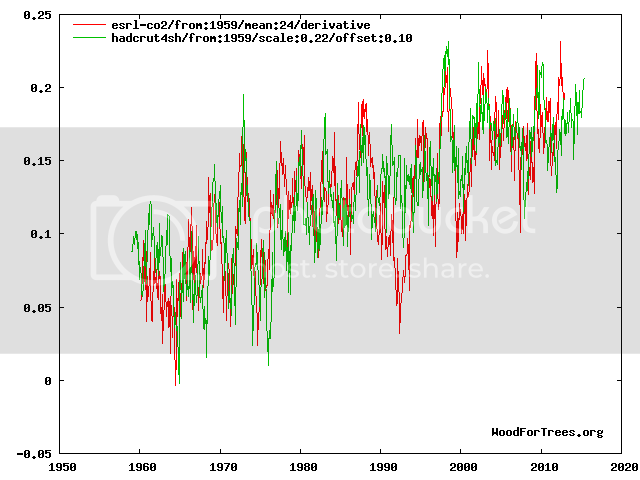 So RSS keeps all available data even though some show cooling and others show warming relative to each other. UAH 5 uses only NASA Aqua AMSU for recent data. I wonder what UAH 6 uses? I wonder how large or small you could make your trend just by dropping or adding satellites. I’m not convinced that making judgement calls is really better than using all available data. I heard via a poster presenter at the recent Fall AGU Meeting that drift of satellites can cause as much as a 1 C/decade drift in measured temperature trends. Well, this discussion is about the trend during the alleged pause years or AMSU years, ie from 1997-2000 til now. All other reanalysis and radiosonde datasets agree with those above. The new RSS TTT v4 have a trend roughly the same as UAH 5.6. Why should AMSU-5 on NOAA-15 be OK? Is it normal that the trend is 0.15 C/ decade lower than that of AMSU-4 (Mo 2009)? Is it normal that AMSU-5 on NOAA-15 drifts versus the other AMSU-5s and makes the joint Channel 5 trend much lower than that of a weighted average of nearby Channel 4 and 6? we have examined the NOAA-15 trends (unadjusted) as a function of height…channels 3,4,5,6,7,8,9….and ch. 4 is an outlier. Ch. 5 does not significantly depart from the vertical profile of trends produced by the other channels. The AMSU channel 4 has a history of problems on most of the AMSUs for some reason, including channel failures. Yes, but in the AMSU-only dataset by NOAA STAR, state of the art intercalibrated and adjusted, AMSU 5 is the obvious outlier in trend vs the other channels. AMSU 4, a TLT in itself, has a slightly lower trend than UAH 5.6 TLT over the 1998-2011 period, which is in the lower end of those trends suggested by radiosondes and reanalyses. In the NOAA STAR poster, it is quite obvious that there is a drift in NOAA-15 AMSU 5 versus the other AMSU-satellites, also after intercalibration, etc.. This is the tell-tale signature of AGW science. Speaking for myself, there is no need to look any further. Denialist that I am. Amazing that such wide disagreements exist within interpretations of the ‘best data we have’ (hat-tip Judith Curry). Don’t be amazed, be climatized. I wonder anyway why the diurnal drift could have any influence on a monthly average. The satellites circles the earth in 1.5 to 2 hours, so it must be very small residuals that makes the difference, and for annual averages it must be minimal. I compare it with my natural gas use for heating. I read it every week almost the same hour, but some small differences in reading hour could make one week seem to be more different than it should, especially combined with intermittent burning of the boiler. Is it because the variation in perceived temperature vary so much over a circle, that even a small timing difference could alter the monthly and yearly averages by those 0.05 to 0.1K. This episode shows that trying to model atmospheric temperatures from satellite measurements is far too complicated and seemingly impossible to get right. And as a result, no one’s data can be trusted. You all have been fiddling with adjustments for, what, 20 years now? This reinforces what Carl Mears wrote last year — the surface temperature network is far more reliable. Davie, the only temperatures you like are those that are adjusted to match your pseudoscience. The development of modern methods to obtain accurate global temperatures will give you nightmares. You might want to sleep with your lights on…. geran, That is BS and you know it. You favour cooling that’s your bias. Davie is afraid of the dark and Ross is playing games with himself. Geran: Dumb. What you are seeing here are precisely arguments about adjustments, UAH’s vs RSS’s. Clearly these adjustments are very complex and very subtle. There have been atmospheric models of temperature for 37+ years, and still they are arguing about them. At least Mears & Wentz’s latest adjustments have appeared in the peer reviewed literature. UAH argues by blog post. I don’t see much reason to trust ANY satellite calculations of atmospheric temperatures. Who are the peers of Mears and Wentz? Spencer and Christy. No Davie, what you are seeing here is the development of a new technology for measuring global temps. The UAH folks are working to refine the new techniques. The methodology is already proven, but they continue to try to improve the accuracy. What is dumb is 1) denying the science; 2) denying the technology; 3) not having a meaningful career, and 4) criticizing the earned income of those that do. Well said geran, I’m by your side. They are still arguing about the surface temperature set also. In fact they just re-wrote them to erase the pause a couple of months ago. And how long have they had those data sets? 100 years? A bit of correction, the blog post above states that the UAH diurnal adjustments have been submitted for publication. Which of course thew reason why the greatest divergence occurs between surface and satellite datasets????????? Sorry, but does the update not pretty much destroy the article? 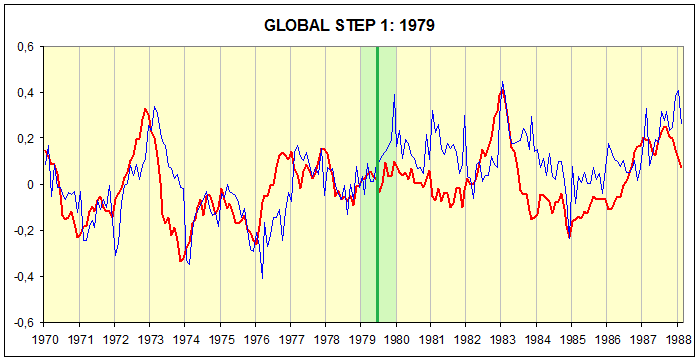 The effect of this change on the global mean trend is fairly minor. 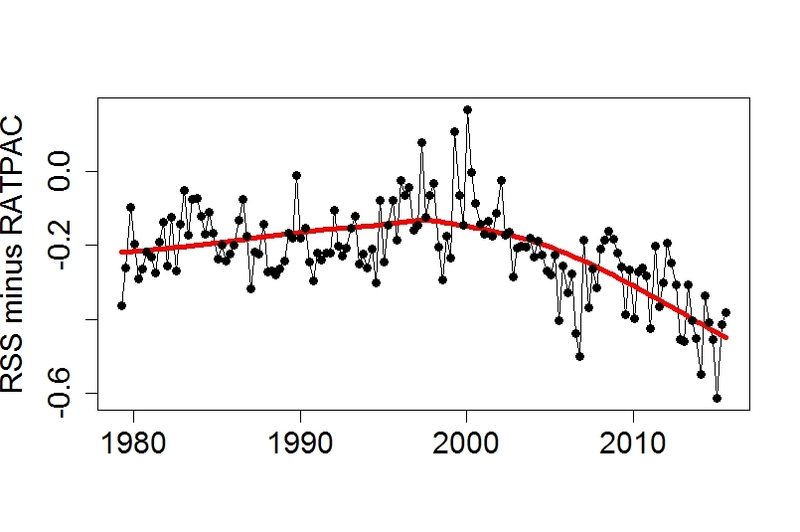 If the post 2011 NOAA-15 data were included, the 1988-2014 AMSU trend would decrease by 0.004 K/decade. We note that if the AQUA data, which we excluded because of excess noise after December 2009, were also included the 1988-2013 AMSU trend would increase by 0.035 K/decade, more than canceling the effects of excluding the post-2011 NOAA-15 data. I’m not an expert in the subject, I’m not even a novice, so I cannot say whether Mears and Wentz are right or whether Spencer and Christy are right, or whether they are all right or all wrong. All I can do is report what was in the paper. What I can say is that what was in the paper doesn’t seem to gel with Roy’s comment to Anthony. Dr Mears had told me that, as stated in their paper, they cannot tell if the problem is NOAA-14 or NOAA-15 or both. It doesn’t make a huge difference to the trend whichever way they go – if they removed NOAA-14 it would reduce the trend to Feb 2016 from 0.133 C/decade to 0.123 C/decade. There is no evidence that NOAA-14 drifts for time periods before 1998, because it agrees well with measurements made by other MSU satellites (NOAA-11 and NOAA-12) over the ocean, where the diurnal adjustment is not important. The drift would have to suddenly appear in 1998.
we assume that the error is shared between them, and we keep all the data. *We keep about a year of data during the MSU/AMSU oeverlap period — any shorter time period would lead to excess noise in the MSU-AMSU difference we use to adjust AMSU to match MSU. These results are reported in the paper, and the differences between them should be viewed as part of the uncertainty in the final results. For the final dataset, we present case 3 where the errors are shared between NOAA-14 and NOAA-15, which is reasonable because we do not know the source of the problem. Sou 5:45 am AEDT 5 March 2016 Hot Whopper. Who is correct. Roy makes a few leaps and assumptions. The title of this thread IMHO is both rude and condescending. It is not helpful to loaded with prejudice and confirmation bias to start with. Aside from all the theoretical rhetoric, we now have a Hockey Stick situation in the UAH temperatures. See how Ross quotes Sou as an authority on the matter. And what does she say? That she is not qualified to judge, but then offers her opinion anyway. Science from Ross. mpainter, I see you can’t read, can you? That’s your science then? Misquoting and misreading peer reviewed stuff again? Biased to your coolest extreme are you? But Ross was not done quoting the self-confessed non-authority as an authority on the subject. He ends his comment with another quote from Sou. mpainter, I think Roy Spencer has rushed his reply. He (Roy) also expresses doubt. It is just finger pointing at this stage. That a burp actually (or sudden spike) in temperatures are a consequence of strong El Ninos (when oceanic heat is released into the atmosphere). And further this spike of 1997 has come mean in the eyes of the “cooler” or the “pause” people that the trends of [email protected] estimates are incorrect. Now we have two EL Nino spikes (one now developing) we shall see over the two years the ultimate proof how variability interplays its tricks on the estimate CO2 sensitivity. The next two years of temperatures will either strengthen the calculated higher end of CO2 sensitivity or show sensitivity is not as high. Which ever way it falls, there will many challenged over these next few years over there stand. You are incoherent. Best stick to quoting Sou. I’ve got a CO2 sensitivity. I get extremely sensitive whenever I hear loons like Ross,rabbiting on about CO2 sensitivity. What’s the difference between CO2 sensitivity and CO2 forcing,Ross? Methinks it’s just linearly related to your amount of Koolaid uptake. Mack, if you don’t know the difference between forcing and sensitivity, you really ought to look that up and learn it. “Mack, if you don’t know the difference between forcing and sensitivity, you really ought to look that up and learn it. Yes David, I’ll follow your advice. So looking up Wikipedia for the definition of sensitivity…says Wiki..
Now, I don’t know about you, David, but this whole concoction seems double-dutch to me. What the hell does that second sentence even mean? The first sentence says…”energy radiated back to space”. Well space, as we understand it nowdays, David, begins somewhere above the thermosphere,ie the Exosphere..and Earth is what we stand on. But the second sentence completely takes the cake…contradicting the first by introducing some gobble-de-gook about watts/sq.m. “quantified at the tropopause”?? This is climate “science” at its best /sarc. But you can see the whole “problem” with your theory David. 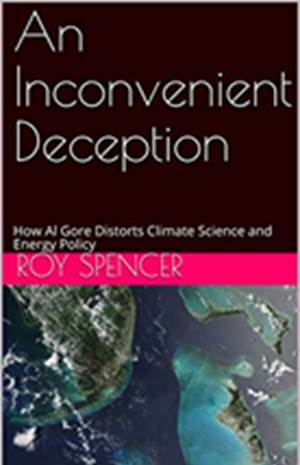 Climatologists,(no disrespect for Roy)have taken on board this theory and have concentrated on where the climate is..ie. below the tropopause. This is, after all,where we live, and really all that matters. But when we are talking about energy balances for the planet, and incoming and out-going radiation of watts/sq.m ..it’s physics. Just call it a different branch of science. There is this artificiallity of just cutting off of the atmosphere at the Tropopause. It only fits the thinking of Arrhenius, Tyndall, etc. in the infancy of observing radiative properties of gases in sealed tubes. It’s an old,outdated theory,..not pertaining to the reality of this Earth and its atmosphere. Davie, hopefully Mack explained it well enough. It is YOU that really needs to learn! The latest (Feb) anomaly for RSS in the old version 3 is also a pause-buster, according to the old eyecrometer metric skeptics have been relying on. It’s odd. Neither the ‘pause’ nor the new, slight warming trend were /are statistically significant phenomena. But at least pause-o-philes are being consistent and acknowledging the end of the ‘pause’ (even if temporarily), despite the new warm trend lacking statistical significance. Claiming the end of a “pause” is climatologically meaningless. It is just numerology and has no significance whatsoever for climate science or considerations of AGW. Not necessarily. You can have a situation in which the same issue affects two datasets (RSS 3.3 and 4 in this case), but it’s obscured by other issues in one case. The divergence between UAH6 and RSS4 happens basically from 1992 to 2005, which is why Christy compared the before-and-after temperatures (1990-1994 average vs 2003-2007 average) for UAH6, RSS4, and balloon averages. It would be nice if the same comparison was made for RSS3.3. Or one could subtract RSS3.3 from UAH6 to see if any similar divergence emerges. (Yes, UAH6 and RSS3.3 had similar trends at 0.07C/decade, but you could still have a divergence between them, i.e. 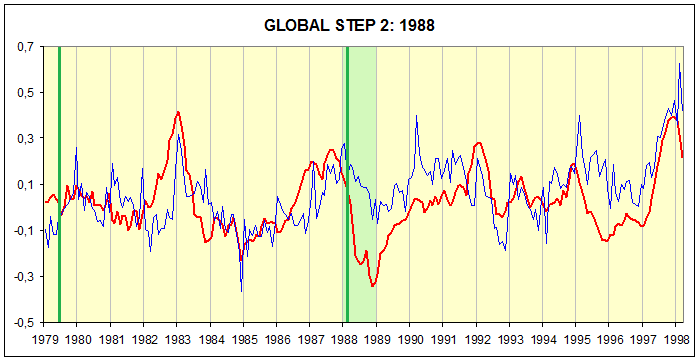 RSS trending cooler prior to 1992, then jumping in 1992-2005. Just because two multi-decade trends are similar, doesn’t mean their up and downs agree). The firm started out all right, but then went bust as the government subsidies were removed. The bloke also crashed his helicopter so I am glad I turned down all invites to travel with him. Interesting story, dave. And, “Dr. Simpson” probably learned everything from Dr. Spencer. Simpson… Spencer… apologies to Dr Spencer. But I am passing a kidney stone. I recommend it for putting trivial matters like global warming in their proper perspective. yes and they are wrong…..
“Does this mean well see snow at Easter? That’s unfortunate. Solar deserves subsidies as long as fossil fuel producers and users are allowed to pollute willy nilly, free of charge, with everyone else paying the bill. Plant food is not pollution, David. Perhaps the biggest example of cognitive dissonance in the climate debate comes from warmer commentators who complain that we are ‘doing nothing about’ or ‘standing by’ CO2 emissions, and in the next blog post celebrate how many taxes and regulations have been passed. It never dawns on the whiners that governments are in fact doing a lot of things to reduce CO2 emissions – it’s just that these things aren’t very effective. Rather than calling for different measures, they either call for more ineffective steps, or resume their content-free complaints that ‘something must be done’ (by someone, presumably). Of course, pointing to actual solutions would only drive home the point that the current policies are useless, and that’s not the kind of argument they want to make. Needless to say, these territories continued to subsidize renewables even though fossil fuels were already paying for CO2 emission allowances. In fact, the territories implementing cap and trade or (less commonly) a carbon tax were usually the most profligate in subsidizing renewables. And the number of such territories is high enough that the World Bank deemed it worth the effort making a report just to list info on them. To argue that ‘fossil fuel producers and users are allowed to pollute willy nilly, free of charge’ is just ludicrous. These cap and trade generally focused on big emitters, basically power plants and factories. But in th EU for instance they include air travel. In California they include gasoline and diesel.Besides, the extremely high taxes Europe and other regions levy on gasoline and diesel have the same effect a CO2 tax or cap-and-trade system would have, even if they aren’t explicitly designed to discourage emissions. In several European countries gasoline is taxed to the equivalent of $300/ton of CO2, while the price of such allowances in the Emissions Trading Scheme hovers around $10 a ton. (Apparently CO2 from exhaust pipes is 30 times more dangerous than CO2 from smokestacks). In short: renewable energy companies were receiving all kinds of subsidies under the pretext of reducing CO2 emissions, when in fact those emissions were already priced. This means the subsidies were undeserved and the renewable companies should pay them back – with interest. I’m sure David Appell will agree. *I assume by pollution you mean CO2. Otherwise it wouldn’t make sense to talk about ‘fossil fuels’, because natural gas (and natural gas liquids) have minimal emissions of non-CO2 pollutants. **You specifically mentioned solar, and the previous commenter talked about a solar heating company. Nevertheless, if you specifically refer to home heating, the list of countries taxing CO2 would shrink dramatically. Basically it’s France, Sweden, and if there’s anyone else I missed it. For some reason politicians think CO2 from boilers and stoves is less evil than CO2 from exhaust pipes. What are the pollutants David? Please quantify, eg. x/mwh. If you mean the conspiracy to confirm RSS3.3 instead of RSS4, yes. By the way, figure 15 is very curious. Stratospheric cooling is supposed to be the ‘fingerprint’ of greenhouse warming, but in fact this cooling was much more pronounced from 1960 to 1990. Since then the cooling has continued but at a much reduced pace, at least according to the JRA-55 series. 1) RSS and UAH try to meausure the lower stratosphere, not all of it. 2) stratospheric temperatures are complicated by ozone loss. In short, you can’t consider RSS LS and UAH LS as indicators of the enhancing greenhouse effect. I only referenced JRA55, a balloon series. JR55 TLT is slightly warmer than RSS v3 from the late 90s. ‘Fingerprint’ should appear in the lower stratosphere, which is more profoundly affected (supposedly) by changes in OLR from the troposphere – check fig 14 (a) for that. New JR55 is a steeper trend than JR25. Still room for conspiracy theorizing. That mess was meant to be a winkie. I could have used the old /sarc tag to the same effect. Satellite sensors showed that AGW was a failed theory so now we have a trashing of the satellite sensors. Roy is trying to maintain his integrity in the face of a scurrilous attack on satellite sensing generally. The AGW proponents went for the most amenable target and now that it has been discredited there is doubt over Roy’s work too. This is politics rather than science. Meanwhile the stratosphere is no longer cooling and may be warming, the ‘pause’ will resume with the next La Nina, global cloudiness has increased, the jetstream tracks are waving all over the place so as to produce both warming and cooling extremes in different localities, the sun is still quiet, there is still no ‘hot spot’ in the upper troposphere. All because (radiative only) astrophysicists invaded the climate scene with no knowledge of meteorology which accounts for conduction and convection as well as radiation. No the problem exists in all satellite packages and methodologies to account for satellite reliability in deriving temperatures from the code modelling algorithms. There is a distinct bias to cooler temperatures due to a complex set of satellite positioning caused by decay in their orbits. These are NOT raw data reads of temperature reads from Satellites. Satellite temperatures will never be able to show that AGW is a failure, or a successful, theory, over the time spans being talked about here. The best metric of a planetary energy imbalance is, by far, ocean warming. And that continues steadily, and is even accelerating. OHC is not determined by the GHE. Water is opaque to LWIR. Ocean warming is another AGW myth. That’s not what David is arguing. His comment is about temperature trends. Attribution (GHE or not) is a different conversation. And yes, the upper oceans are an excellent metric of temperature change. Roger Pielke Snr pointed this out years ago. David alludes to ocean warming. SST increase this century is due to increased insolation. DWLWIR does not contribute heat to the oceans and the notion that ghg contributes to SST is another AGW myth. SST is determined by insolation, not ghg. The fault is with basic assumptions of AGW which applies black body principles to the earth’s surface. These yield spurious results; the earth’s surface does not behave as a BB. Repeat: SST is determined by insolation and that alone (but influenced by other processes such as wind, circulation,etc). 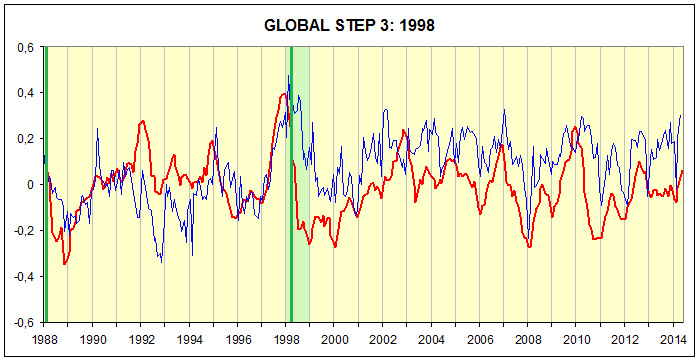 Regarding global temperature trends, this is largely influenced by SST which we know to be determined by insolation. We also know that insolation increased during the latter 20th Century. Davie, we will remember this nonsense when the next La Nina occurs. It is interesting to note that ‘most recent TSI reconstructions point to an increase of only about 0.05% to 0.1% between the Maunder Minimum and the present’. If the TSI got such a low increase only: where is then the proof of an increase of OHC solely due insolation? All SSN (sun spot number) references for the XXth century published before 2014 are completely flawed. david says satellite temperatures will never be able to show agw is a failure,then goes on to show yet another “method” that has error bars an order of magnitude greater than what the supposed measurement is. zeta joules, yet more wigglenomics david. Carl Mears seems to think so. I doubt that even Carl Mears would have anything to do with David Appell, the universal climate science joke. 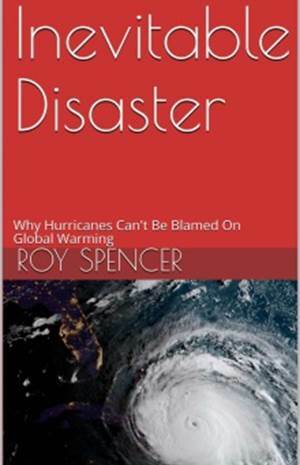 Roy Spencer keeps him around for laughs, and he also serves as an example of foaming AGW zealotry. As above. As a data scientist, I am among the first to acknowledge that all climate datasets likely contain some errors. However, I have a hard time believing that both the satellite and the surface temperature datasets have errors large enough to account for the model/observation differences. 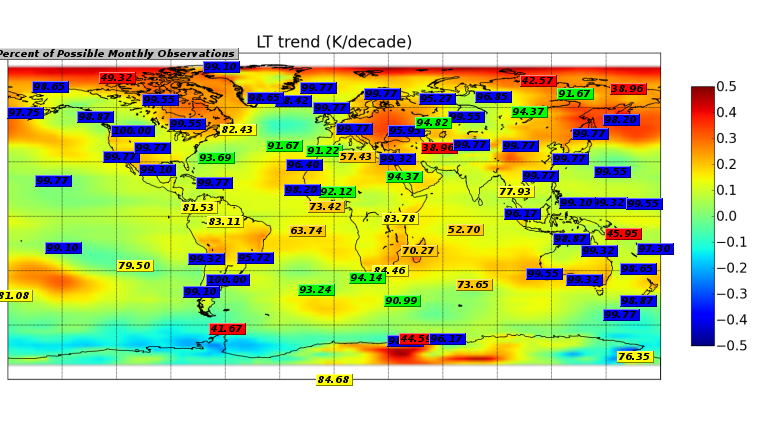 For example, the global trend uncertainty (2-sigma) for the global TLT trend is around 0.03 K/decade (Mears et al. 2011). Even if 0.03 K/decade were added to the best-estimate trend value of 0.123 K/decade, it would still be at the extreme low end of the model trends. A similar, but stronger case can be made using surface temperature datasets, which I consider to be more reliable than satellite datasets (they certainly agree with each other better than the various satellite datasets do!). So I dont think the problem can be explained fully by measurement errors. In this quote, Mears goes as far as he dares in condemnation of the global climate models. Ross, your pseudoscience leads you to believe more in the models than actual measurements. I’m not sure that anyone thinks that measurement error is the whole story. As for “condemnation,” I’m not sure how this applies to scientific discourse. Surface obs were at the lower end of the ensemble envelope, satellite obs even lower. I don’t think anyone with scientific literacy would consider climate models worthy of condemnation, or point blank assume that any particular data set was the Truth (TM). As a point of interest, it would be interesting to see how the most recent couple of months factor against the model ensemble. Haven’t seen anyone plot that as yet. Read it again. Try for better understanding. Roger, You are talking about your little patch of earth called the USA. That is NOT the world’s only data source! His opinion is notable, considering his expertise, but no one’s view is oracular. From Mears: “it could be from an error in the surface datasets…”. I wonder that Mears does not completely ignore the spurious warming of surface datasets, as does David Appell. I’d guess Mears does not have a myopic point of view, but considers various possibilities. Those with myopic views may simply be incapable of appreciating this. They’d also be completely incapable of understanding the way science works. Whenever you see that phrase anywhere, you know you are being treated to humbuggery by a lightweight who has exhausted his talking points, and is looking for weasel words that will allow him to disengage without admitting that he has no idea what he is talking about. i would say the surface temperature network is as reliable as the ocean heat content network . Now we are just waiting for Spencer and Christy to publish their algortithm for version 6.0 beta5 so that Mears can give it the same scrutiny. Perhaps it would be more fair to compare RSS v4 with UAH v5 until then? So to summarise, the satellite data is pretty unreliable and fluctuates wildly depending on how you wish to interpret the data. So to summarize, your interpretation is pretty unreliable and fluctuates wildly depending on how much kook-aid you have consumed. Geran, Stop being so b***dy rude! Settle down there,Rossbaby, go take a Bex and a little lie down. I have decided to study the papers written by DC and I have to tell you that the physics therein is sound and totally correct. This is brilliant work at the forefront of physics research, and it will change the world once our Physics Department starts promulgating his hypothesis which totally refutes the Greenhouse one. Another day, another set of pseudonyms, eh DC? JackHarris and RoysPhysicsTeacher this time? They are pretty easy to identify given your feverish (and ‘not even wrong’) re-interpretations of basic science. I would advise all to mail Roy with his latest pseudonym. I have with his last 2 and Roy has responded by removing. Likely Harris to, so that is pending. On what basis of physics is pseudo-scattering of photons based upon? A molecule or atom are excited or in lower states and can be moved to higher energy levels by an absorbed photon. This process is very short lived except certain exceptions where an atom or molecule can stay in an excited state a considerable relative time. Most stated times are in the order of millionth’s of a second average time spent in the excited state is 10^-8 seconds. The only logical time a molecule would be pseudo-scattered would be when it is at energy levels that would not allow a photon to be absorbed. The probability of is very low at Earth’s surface temperature. I hope you rethink your thought process that has allowed you to conclude the work is brilliant and sound and totally correct. It is obvious from your statement “a molecule would be pseudo-scattered” that you have no idea what we physicists describe as pseudo scattering of photons. It is the process by which it is ensured that radiation obeys the Second Law of Thermodynamics. However our Physics Department is primarily interested in the second paper which is not in any way based on pseudo-scattering. Do you have some professional interest in this physics? If so I suggest you read the paper. Since your claim is a PhD physics major can you link me to one source that describes the process of pseudo scattering of photons. I have read many articles on radiative energy transfer and I have never seen any text mention this pseudo scattering phenomena. If it is common for the physics community to use this process then certainly there should be some links to materials describing the process. In Heat Transfer Textbooks such as this link, they spend an entire chapter on thermal radiation heat transfer (Chapter 10) without the slightest mention of pseudo scattering. This textbook suggests the opposite. Both surfaces emit IR at each other and the Heat transfer is the Net energy between the two emissions. If use different material then please provide a link to it and I do not accept the writings of Claes Johnson as a source. Again you will not provide one link to any thermodynamics equation or book other than Claes Johnson’s paper to support your idea of pseudo-scattering. I guess the ban did not hold long. So do we go through 3000 more comments and you will not provide a shred of evidence to support any of your ideas but your own publications and Claes Johnson. NO Experiments, none, nothing. Just comment after comment after comment. Are you going to try and make it 5000 this time and still not do one valid experiment. Why do yo pretend to be a PhD physics major? Experiment for you. If I do it you will not believe the results, if anyone else but yourself does it you will not accept it. It is an easy experiment for you do to and it will prove your ideas false but it will allow you to grow. Just put the set-up (lights and thermometer on boards so they do not change their configurations at all so they are the same in all your tests). The control you will change is ambient temperature (the colder one) to prove to yourself that the cold background temp has a direct influence on the equilibrium temperature you will be able to achieve. Take you set up at room temp and measure all the results similar to the PSI test (no spotlight, one spotlight, then two). Now do it with different background temperatures with both hotter and colder and try to get significant differences. Maybe do one test in a cold meat locker and another in a sauna and see if what effect (if any) the background surrounding energy flux has on the equilibrium temp. Now you do not have to comment or respond to this post. Just do a series of tests and see what the outcome is and then honestly report what you find. I feel Roy may ban me as well as you if our comments go on for thousands of posts. I give you an experiment and hope you will take the time to do REAL SCIENCE and not rely just on blind faith and belief of how you think reality works. So it basically appears you will not do the experiment I suggested but will blabber on for another thousand posts about your stupid nonsense that is not confirmed by anything except your mindless repetition and goofy assertions with no backing evidence. You are so tiresome and boring and all I asked you to do was one easy experiment and yet you won’t. The PSI experiment demonstrates your words are idiotic. Two fluxes do add to generate a higher equilibrium temperature than just on flux will achieve. Your steak argument is totally bogus. You are mindlessly assuming the steak is receiving 545 W/m^2 from your radiator because it drives the temperature up to 40 C. But you did not take the ambient flux into consideration. You just ignore this. Have you done your steak experiment in a meat locker where the ambient temp is below 0 C and see if your heater will still warm the steak to 40 C? You only assume it will but are far too lazy to actually test it. You are a lazy and mindless person that needs to stop posting and start testing. Wake up! You might even be right and it will raise the steak temp to 40 C but do an experiment and don’t tell me what you think it will do, DO IT and then tell me what it actually did. I really dislike your type of cultish behavior. You endlessly repeat things over and over like in a hypnotic trance but will refuse to experiment or prove anything you claim or state. I think Ball4 posted over 500 times to have you present some experimental evidence and you did nothing but repeat the same stupid points thousands of times and through the years. Great post and discusion… always enjoy learning. So generic question for whoever: will there be an opportunity to evaluate the quality of global temperature measurements during the next cooling phase from a major volacanic eruption? It seems during the cooling pulse from the eruption the change in radiative forcing could be measured (and modeled simply using established methods) then compared to the sensitivity of each method. My concern in all of this is i dont know what the global temperature estimate even represents bc there is verticle movement of energy in ocean currents at many periods that represent older conditions (ENSO is a high freq example PDO is another big one)… so ultimately there are major lags. These lags can be seen in many paleo proxy data and can be more than 2 decades when looking at solar activity vs isotop temp estimates in annual records. Its false precision. Have you thought about publishing a rebuttal? Fact: All of the data sets, surface and satellite, except for the most aggressively tuned GISS, agreed fairly closely before the effort was made to erase the “pause”, and even GISS was not that far off. Fact: The “pause” is very inconvenient for the alarmists, as it directly contradicts the notion that CO2 is a significant driver of Earthly temperatures. Fact: The “pause” is confirmed by independent proxies, e.g., the rate of change of CO2 clearly shows the “pause”. Fact: The legerdemain involved in erasing the “pause” still does not in any way increase temperatures anywhere near the levels projected by the models. In the most generous analysis, one must still conclude that the climate models are not ready for prime time, and that the alarmist panic is neurotic and/or self-serving. Another fact, scores of papers have been written to explain or explain away the pause, the authors including the big names such as Hansen, Trenberth, Santer, other high profile types. 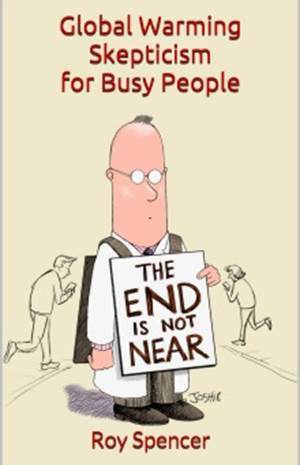 I should finish my thought: the pause was real enough for the AGW zealots until they realized that it was not going to disappear unless they disappeared it. You can’t read trend lines Bart. Go back and do some High School grade college. Serious – Yes you can! It’s called climate variability. Those temps are not staying down any time soon. DOH! Stop it – just stop it. Plenty of short term variations in the assorted temperature records, both up and down. None of which since the 1970’s are statistically significant, none of which support a significant change in trends. Significance testing is a one-sided exclusion test, so please repeat after me – A failure to exclude the null does not mean the null is true. Rather, you are looking at too little data to make a determination of the tested hypothesis. * Over no period is warming statistically excluded. * Over no period is the hypothesis of “no warming” statistically supported against a null hypothesis of the longer term trends. * And over any period with enough data to actually separate the two hypotheses there is warming. The so-called ‘pause’ is statistically nonsense. Well done, KR. You’ve almost got it so that everything is “proof” of AGW, and nothing falsifies it. Now, just define “cooling” as evidence of AGW, and your 100% into pseudoscience! Well done, geran. Your comment is wholly content free. According to the UAH global temperature anomaly plot, there was no warming before 1998 and none after 2002. 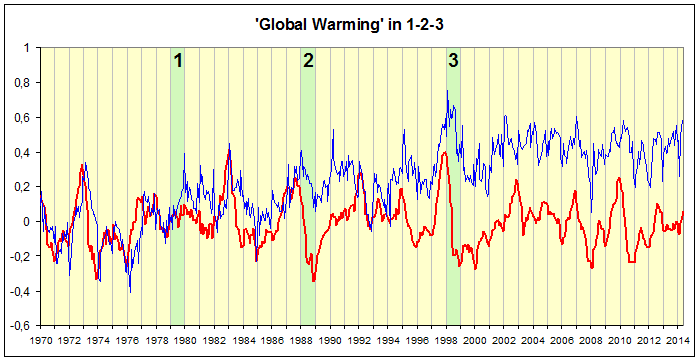 There warming was a step-up which is most evident circa 2000-2002. There you are: two flat trends connected by a 0.25-0.3 C step-up. Crank that through your statistical dicer/slicer. And whilst doing that, you might explain how it was CO2 that done it. KR, anyone deeming my comment “wholly content free” would not have responded. Are you this confused often? Trend up to 1998: 0.044 Â±0.162 Â°C/decade (2Ïƒ), or -0.118 to 0.206. 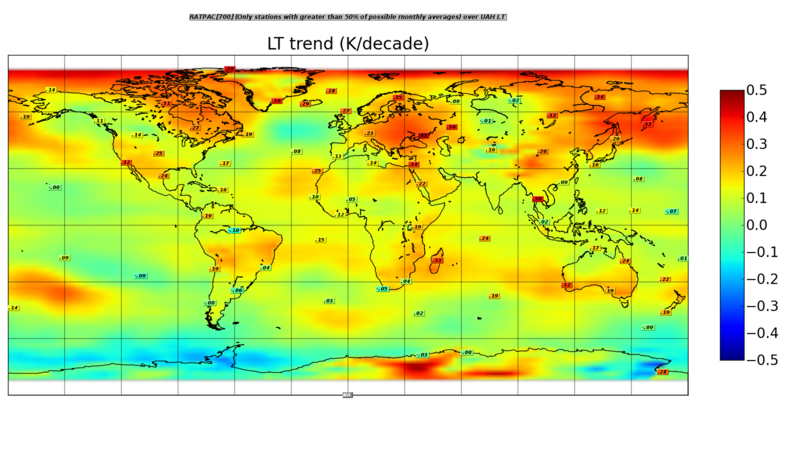 Trend from 2002: 0.094 Â±0.229 Â°C/decade (2Ïƒ), or -0.135 to 0.323. Note that a significant longer term trend, such as the GISTEMP 0.162 over that period, is _not_ even remotely excluded by the statistics. Making unsupported claims from short periods only demonstrates a lack of statistical expertise. As for attribution, I would suggest looking at IPCC AR5 WG1, in particular Chapter 10, for an overview of the current literature. It’s reasonably basic physics – Arrhenius, for example, wrote about climate sensitivity in 1896. Increases in CO2 cause warming of the climate, which has been understood for about 150 years. See my above comment. A step-up is not a trend. Your thirty-five year trend is spurious. No warming before 1998. None after 2002. The step-up coincides with late 20th Century changes in cloud albedo, globally. Nothing to do with CO2. Sorry. mpainter – We use statistics because the ‘eyecrometer’ can so easily be fooled. And the statistics simply don’t support your claim based on time periods too short for significance. Statistically supporting steps requires even _more data, look up the Akaike information criterion (AIC) for details on that. 1979-1998 and 2002-2016 are far too short to make any claims regarding the existence of the longer term observed trend – there just isn’t enough data. Claims from short periods such as yours are simply unsupportable based on the actual data. There’s really nothing more to discuss in that regard. Nothing can overturn the incontrovertible fact of two flat trends connected by a step-up. This is observation and yes, I use my eyes. I recommend such a practice. You should try it. The approved method, you see. KR, Arrhenius was proved wrong by peers of his time. His bogus CO2 equation has no scientific validation or mathematical proof. He dreamed it up! But, such dreams are what make up pseudoscience. geran – Angstrom was demonstrated to be in error, and Arrhenius’s work holds up within the limits of the instrumentation of his time. Sorry. mpainter – Your claims are equivalent to claiming that because the first Tuesday in summer was cooler than the first Monday, that summer won’t occur. You making simply noise about the noise. Not the trends. KR: the step-up is 0.25-0.3 C in two years. You call that noise. Noise to you, but observation to me. I suspect that whatever may be contrary to the AGW meme is noise to you. Science or cult? KR: the step-up is 0.25-0.3 C in two years. You call that noise. Noise to you, but observation to me. Kristian, We agree that the step-up included the 98 El Nino. I refer to the interval at 2000-2002 as the most obvious manifestation of this, referring to the UAH plot. Imo, KR does the AGW reflex of ignoring data. KR, such a statement is meaningless. It just signifies he found (“cherry-picked”) a data set to match. The equation has no validity for 400 ppm. Therefore, it has NO validity at all. It’s blatant pseudoscience. The so-called â€˜pauseâ€™ is statistically nonsense. This misleading information about global Warming is is shocking and is in straight out denial of scientific reality. Scientists unanimously qualify this article as misleading and in disagreement with elementary science. The author uses a scientifically unfounded argument to support his claim that a global temperature for the surface of the Earth is meaningless. These comments are the overall opinion of scientists on the article, they are substantiated by their knowledge in the field and by the content of the analysis in the annotations on the article. See who the scientists quoted are. The argument has two parts: a) that the accuracy of the measurements is too low to claim a record, b) that the global temperature is meaningless. a) is an affirmation that is not supported by the facts (the actual accuracy is indeed enough to affirm that the month is hottest or at least amongst the hottest). b) This is a repetition of a sophisticated but irrelevant argument put forward many years ago by Essex and McKitrick. This article recycles old, specious skeptic talking points about how the Earths global temperature does not exist, cannot be computed and/or is irrelevant to its inhabitants. All long-debunked nonsense. This article makes several inaccurate claims and the authors demonstrates a nearly complete lack of knowledge about measurement of the Earths climate. The claims about temperature accuracy, ocean measurements, thermodynamics and others are just plain wrong. The climate feedback organisation, Ross.? The Rapid Response Team to rapidly stamp out dissent and denialism, whenever it may flare up. To serve the Cause and protect our govt. paycheck. The moniker RPT is especially appropriate, since it is generally used as an abbreviation for “repeat” or “I repeat”. I just bought your 2010 book (Blunder…) and according to an old post on this site a spreadsheet model is supposed to be available to go with it. The link in your post (April 26, 2010) “Simple climate model…) is broken. Would you mind either emailing me the spreadsheet or fixing the link? Sorry to contact you here, but I couldn’t find your email. I just sent it to you by email. In a personal communication Roy has said that if he cannot stop you getting on here and repeating your drivel …. He will be forced to close down comments entirely. Are you selfish as well as scientifically deluded? Please ponder the consequences of your actions here. It is Roy’s Blog and not yours – find the personal integrity to abide by his request. Other readers – you have responsibility too – those that engage him are, apart from wasting your time, also endangering the existence of the thing you post on. Oh don’t be silly as well as deluded. You have no right to post here. In doing so against his repeated requested and attempts to stop you – it is you that are violating his integrity. You appear to have none. I wonder how much RSS is affected by alarmist forces. My understanding is that the initial purpose of RSS was to disprove UAH findings. How much of there recent findings on satellite issues is due to Trenberth (NCAR), NASA GISS and NOAA factions? I read you closed commenting because a known crackpot who appears to write above. If you like it, your audience is able establish a ring moderators to delete comments that are troublesome or illegal. You just need to ask – and trust a community can produce a style of moderation of your like. An international community from Australia, Europe and America could provide a 24/7 service. I’m very sad reading about your decision to shut down the comments. I don’t agree with it, but I comprehend you. I still hope you’ll return on your decision, and you find an alternative solution.